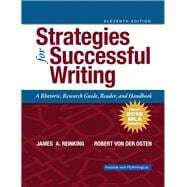 At every step of the writing process, Strategies for Successful Writing supports students as they learn to compose in the rhetorical modes. Over 100 short examples demonstrate writing concepts and strategies, so that they can recognize them more easily in the longer reading selections and apply them in their own compositions. Instruction is kept brief and to the point, so that students spend more time writing and less time reading about writing. Perfect for those seeking support for participating in academic discourse for the first time, this four-in-one guide may be the only text students will need for the composition course.